The accommodations are exactly what it sounds like- shacks. These sharecropper shotgun homes were built in the early 1900's to the mid 1900's, and some have been added fairly recently as the Inn has grown in popularity. (The Tinth, above, was recently constructed with eco friendly materials) There are rows of shacks, spaced over 2 1/2 acres that rent for just $70-$90 a night. There's also a series of hotel suites in the original cotton gin. They proudly state on their site, "The Ritz We Ain't." 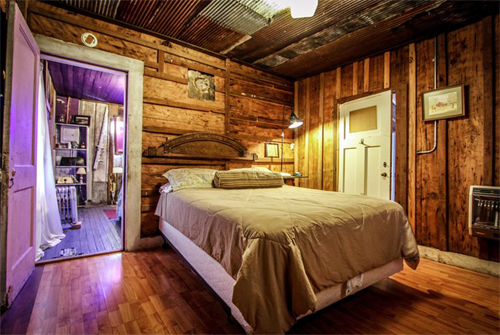 The owners refer to their setup as a B&B, which stands for Bed and Beer. As one of the owners, Guy Malvezzi shared with me over the phone, "People are just looking for something different. You can stay at a Comfort Inn any place in the world. You wake up and can't tell which Comfort Inn you're at. You stay out here and it's a whole different ballgame." The old shacks have been renovated to include heat, AC, plumbing and electricity. There is even internet. Inside the office, you'll find coffee and a box of doughnuts in the morning. Don't expect a buffet...you can get that at the Ritz. This land was once the Hopson Plantation. Guy admits people have a tough time with the word plantation (primarily outside the Delta), but it's important to note these shacks were built way after slavery was abolished. 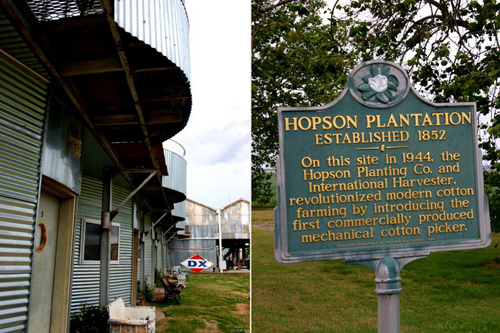 It was here, with the invention of the first mechanical cotton picker, modern cotton farming was born. One of my favorite features on the grounds is the Juke Joint Chapel which combines music and religion themes here in the Bible Belt. They have some incredible live music here- hopefully you'll experience it if you stay. I had to ask Guy about the swing, pictured right. Guy, "Oh that's a satellite dish we had sitting out here forever. I was always trying to figure out what to do with it so I drug it up under that thing and put a swing under it." They added the windmill later as it just looked cool. Many of the old relics found on the grounds Guy found at The Mid South Fair in Memphis. As it was going out of business, they got tons of cool stuff for cheap. 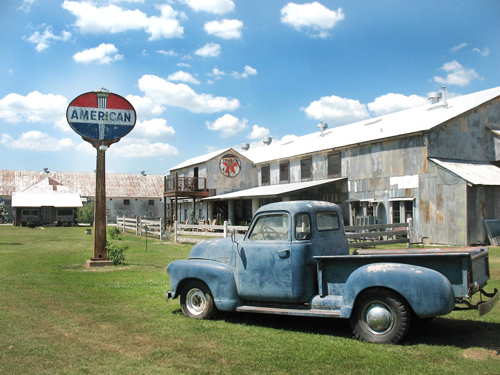 Guy and his business partners started Shack Up Inn as a place to kick back, tell stories, drink beer, play music. They haven't spent any money on advertising and people the world over come to knock on the Lobby door. It's often sold out. I think Guy's right, people are looking for something different.